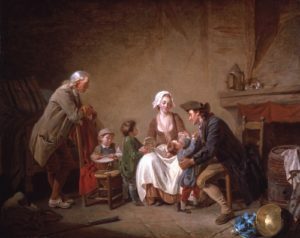 Three generations of a family gather around a humble hearth, forming an image of domestic happiness in a modest setting. When Aubry exhibited the work in 1775 it was praised for its naturalism – the depiction of a range of objects with great truth – but also for its positive influence as a ‘moral genre’. A domestic scene of a loving husband who provides for his wife and three strapping sons and supports his widowed father, it was argued, offers a striking lesson for the dissolute upper classes.